When a listfranc fracture in her left foot kept Canadian hurdle heroine Perdita Felicien out of the 2008 Olympic Games, she spent much of her summer in Mississauga, Ontario, staying in shape as best she could without running, and often that meant climbing on a bike and repeatedly riding up a steep hill in Huron Park. She borrowed that bike from me, and many times I ran alongside her. Last summer when she won her 10th Canadian championship in the 100-metre hurdles I spent the weekend chaperoning her mom, Cathy, and sister Bovella around Calgary. I lost my voice cheering for her, and prepared the tub in our hotel room for her post-race ice bath. And in the tense moments after last month’s Olympic Trials, where she was disqualified over a false start, I grabbed my umbrella and shielded her from the rain falling in cold, heavy drops at Foothills Athletic Park, as she explained to a cluster of reporters how it felt to watch an Olympic dream evaporate. For the past four years the 2012 Games have represented for Perdita an opportunity to claim some late-career glory after a couple of tumultuous seasons, and nobody in her circle ever imagined her not qualifying for London if healthy. We spent that Saturday evening watching television and the clock, checking email and distracting ourselves with small talk, hoping something would change but knowing it wouldn’t. I felt like Jay Gatsby waiting to hear from Daisy wasn’t leaving Tom Buchanan, no matter what. It was as surreal an experience as I can recall, and I recount it here so folks understand my biases up front. Perdita is as close to me as anyone I’ve ever known, and we’ve grown closer each of the five years we’ve known each other. I’ve kneaded the knots in her calves and joined her in sets of high-intensity sprints painful enough to produce endorphins. And I’ve held her close enough to taste her tears, in victory and in disappointment. Perform for as long as Perdita has at the highest level of the sport and you’ll experience plenty of both. As witness and participant in the joy and the heartbreak, I feel blessed. You can take what you’ve just read as proof that I’m too invested to judge certain situations clearly, or you can interpret the relationship between Perdita me as evidence that I have a detailed understanding of track and field. I don’t think the personal bias taints the case I’m about to make, especially since I felt this way long before Perdita’s false start. But I laid it all out so you can judge for yourselves. Either way, the IAAF’s false start rule — automatic DQ for any sprinter who jumps the gun — is the worst piece of legislation in sport. It’s an abomination for sprinters, for fans, and for a sport that struggles to capture the attention of casual sports fans in the years between Olympic Games. Yes, I hate the rule because it cost my best friend a trip to London, but I hated it just as much last year when it cost Usain Bolt a chance at a second consecutive world title in the 100 metre dash, and hated it even before that simply on principle. The principle is that the rule expects sprinters to be something no human being on this other planet has ever been. No other athletes in any sport are forced to conform to such an unforgiving and unreasonable standard. This isn’t to excuse rule-breakers. Leaving the blocks before the gun is as illegal as whacking a basketball player across the forearm as he drives to the basket. But neither is this a simple issue of discipline, or something we can explain by saying athletes should just try harder to follow to the rules. At a certain point we have to admit it’s impossible to follow a rule that doesn’t square with human nature. Imagine basketball had a zero-tolerance rule on fouls. Can you picture LeBron James booted from game seven of the NBA Finals because he nicked an opponent’s wrist while trying to block a first-quarter layup? Or imagine tennis with no second-serves. Get the first serve in or lose the point — and no lets, either. Or imagine baseball with no strikes and balls. A pitcher misses the strike zone once and the batter takes a base. A batter fails to put a strike in play and he heads to the bench. If you can envision any of those scenarios you can also picture what sprinters confront every time they step into the blocks. But you probably can’t imagine them because as much as we hold millionaire athletes to a higher standard of performance, we also realize they’re human beings with imperfections who sometimes need to make adjustments to get things right. Unless they’re sprinters, in which case they need to execute flawlessly the first time or go home. It might not surprise you to learn the IAAF didn’t have athletes in mind when it changed rules around false starts. In the past each athlete in the field was granted one false start but disqualified for a second infraction. But the IAAF began tinkering with the false start rule under pressure from TV networks, who complained that false starts caused delays that in turn complicated broadcast schedules… because networks can’t possibly adjust on the fly the way they do when a baseball game goes to extra innings. A transitional rule introduced in 2003 saw all eight runners charged with a false start when a competitor broke from the blocks, with a disqualification for the next person to false start. That’s the rule that prompted Jon Drummond’s infamous sit-in at the 2003 World Championships in Paris. In 2009 the rule was changed again, this time forbidding any false starts and inviting all of us to examine the massive gap between what’s equal and what’s fair. The rule is equal in that it doesn’t discriminate against any one sprinter. In theory, anyone who jumps the gun is gone — whether it’s the guy who lucked into the final or the guy with three world records and three Olympic gold medals. But it’s patently unfair because it holds sprinters to a different set of standards than any other competitors in a track meet. If a long-jumper hits a huge first jump and fouls his next five attempts he can still win a medal. And if you DQ’d every jumper to put a spike on the plasticine you’d rarely need a sixth round because everyone would have been sent to the sidelines long before then. Same with throws, where competitors can fling the hammer into the cage or step out the front of the shot put circle with the understanding they’ll have another chance after fouling. Pole vaulters and high jumpers have three attempts at each height, and the rules are written that way for a very good reason. The action in every event unfolds at incredibly high speeds, with outcomes determined by fractions of seconds and slivers of inches. Expecting athletes under those circumstances to hit their marks perfectly every time is about as reasonable as expecting Republicans to accept the idea every American deserves health care. Which is to say it’s not reasonable at all. At some level track and field’s lawmakers recognize this reality, and reflect it in the rules of every event. Just not in the sprints, where athletes who are trained to react explosively at the first sharp sound face tensions at the start line few of us can fathom, yet are expected to never flinch. Not if fans make noise because race officials fail to take charge and keep them quiet. Not if the starter holds them in the set position long enough to recite half the alphabet. And not if, under the sheer stress of being a sprinter in a high-level event, cocked and ready to spring from the blocks, somebody jumps a tenth of a second before the gun. Track and field’s rule book says only acceptable response to any of those situations is perfection, whether at a high school meet, the national championships or the Olympic final. Disqualifying high-profile performers from high-stakes competitions is proof that, from an administrative standpoint, the rule works perfectly. But it also proves that from any other standpoint the rule doesn’t work at all. Holding to sprinters to a standard no other competitors are forced to meet doesn’t advance the principle of fair play, and a rule designed to enhance TV feeds actually damages the broadcast product if it eliminates the athletes people tune into see. A sprint final that runs a little long can still make riveting TV, as anyone who watched Donovan Bailey’s 100 metre victory in the 1996 Olympics can tell you. But a sprint final missing big names is always a letdown, and you know it if you watched Yohan Blake blaze a Bolt-free field in Daegu last August. I’m not saying this because I’m biased towards Perdita Felicien, nor am I acting like she’s the only big-name athlete to ever catch a DQ over a false start. She’s not the first, but she’s far from the last. And that’s a problem for anyone who loves track and field. You laid out a perfect argument for why that rule is ridiculous. I had to watch a childhood friend get DQ’d in the hurdles last month because of a false start. And as you said, if you mentioned having that type of rule in half a dozen other sports, someone would think you’re crazy. So many great points made here. Several years ago,an athlete i coached was dq’d on a false start at a high school meet. It was a. 100m semi-final at an Ofsaa qualifier (he had competed at Ofsaa all his previous years in HS). In this case, the starter had no control of the race. In high school track, there is a no scratch rule for finals. That is, if you scratch a final, you effectively scratch all of your events for that day (too many reasons for this to get into, but all of them stupid). In this case, an athlete wishing to save himself for the 4×100, but unable to scratch from his 100m final decided that it would be a good idea to be disruptive and annoying on the start line (wearing a hat, still in his warm-ups, race number pinned on with on pin an hanging, uttering comments etc.). Did the starter put a stop to this or ask the athletes to stand up? Nope. My athlete false started as i was racing to the starter to put a stop to this. I was too late. I protested, but there was no use, it was over. While this was “just a high school race,” all the same consequences still exist: the “right” people didn’t get into the final. I wasn’t there at the trials, but from what i hear, it was not quiet for the start and the meet was far from athlete centered. How can sprinter’s be held to superhuman standards, but officials don’t need to exhibit any degree of consistancy? this hit me morgan. i was reading while at work, in front of others. and had to excuse myself. knowing you, and having met perdita and been in her presence, i couldn’t even imagine the anguish as the results rolled in from this past weekend. and then in addition to the profoundly personal aspect of this story, you lay bare the completely flawed, near criminal, enforcement policy of false starts. the contrasts you draw to other sports is thought provoking- if anything we live in a completely inverted time from those policies that govern track. i think of how many tennis players are given a stage, allowed to be regarded as a true great during their time, all while NEVER winning! You could use drugs and be back in 18 months! to not be allowed to race, because of something that has no bearing on the outcome, and for that to happen to a champion- or anyone of course- is so hard to stomach.. the piece is very touching. i hate that it had to be written. but you should be very proud. my thoughts have turned to perdita often since saturday.. there really are no words. can a sport that struggles for fans cripple itself like this?! Personally I only follow the hurdles for Perdita. I have no interest to tune in now, but wish the other girls well. Any chance the IAAF dissolves this rule? I agree it is as stupid to expect perfection from athletes as it is to expect democrats to understand that there is no free lunch. ie, don’t mix simplistic politics with sports. Free health care is a right, like free education, free police protection and free sidewalks. Lunch is a consumer choice. Feel free to mix sports with simplistic politics anywhere you please, Francis. Free speech is a right… much like health care should be. Thanks for commenting. Actually Republicans do believe that people deserve healthcare. To confuse healthcare and “free” healthcare is rather simplistics hence the line about a freelunch not being free which has nothing to do with a consumer choice. By the way, in the American constitution, no where does it list that “free” healthcare is a right, nor education, nor police protection, etc. There was no need to make your ignorant comment. It was cheap politics. Too bad about your friend and this unfare rule. But she, as Bolt, choses to compete in the sport with these rules. I hear and understand your point, but how do you factor in swimming’s (FINA) zero tolerance for false starts or the fact that this track rule has been in the NCAA system for years (a system in which Perdita excelled and most North American top-level sprinters “cut their teeth” and learned how to sit back in the blocks)? Bolt was “perfect” and ran that 9.58, sans false start. I agree that it’s a harsh rule, but I think the old 2003 rule was worse, a la Drummond. If you false start first, you get a second chance, but if you’re that second poor soul to react to a baby crying in the stands, you’re out. So one person got two chances while everyone else got one. That doesn’t sound very fair to me. And seeing how things are going this season and that 19.26 at the end of last season, it was quite probable that Blake would’ve beat Bolt anyways. Blake’s win was a sign of the future and definitely not a letdown. I agree that the rule is horrible for the reasons already explained. I do believe, however, that TV issues weren’t the only reason the rule was changed. 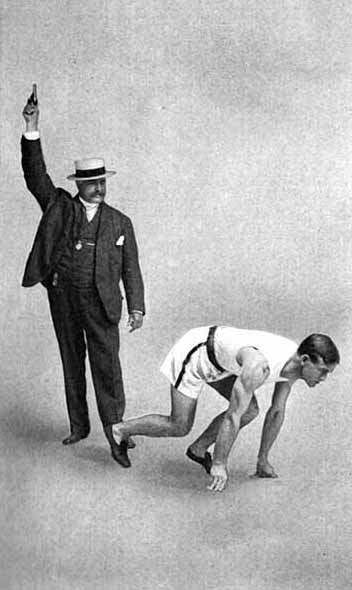 With the old rule, when the first false start was charged on the field, athletes felt free to take a chance on the first start, and some would actually false start intentionally to throw the other athletes off their rhythm. It is my understanding that this gamesmanship and lack of sportsmanship contributed to the decision to change the rule. Now, the new thing to do is hold your hand up before the starter calls the field into set position, which is basically another mind-game tactic. Anyway, thanks for a well-written, insightful article. Felicien has been one of the sport’s true warriors for many years, so it is very disappointing to see her lose out on an Olympic opportunity. But yeah, leave the politics out of it. All that does is tick people off and change the subject. I was speaking with Ato Boldon about this ridiculous FS rule when it was first implemented. And in that discussion we both stated a major global star will fall victim to this and it will diminish a sport that was making a huge comeback. Having a final without Bolt is devastating to the sport as he is the worlds most famous athlete. Furthermore, in previous eras this rule was not in place, so it’s unfair for athletes to have to adapt to it. The reason for the rule is also ridiculous. “Saving tv time”. I 100% disagree with this rule, and if the IAAF is smart they will change it. Being that the 100m Final is the marquee event in the olympics, Perhaps what needs to happen is for every 100m Finallist to purposely FS one by one until nobody is left to race. This protest could create the movement for the IAAF to reinstate the FS rule as it once was. It may seem ridiculous but that is not really the argument. Sure it stinks from one perspective, but the sport is trying to survive and this IS necessary. How many lukewarm track fans and TV watchers are there that groan because the men’s 100 or 110 Hurdles take 15 minutes each due to the idiots trying to time the gun and then get reset? It is a fact of life if we want TV coverage that we CANNOT have that BS. So the athletes, if they continue to want to make a living in this sport, have to learn to cope with it just as anyone who has to deal with many things in their work lives. If multiple false starts occur in a final it gives the casual fan more time to get to know the significance of the event as the commentators usually fill in the time with information about the event and athletes. It also provides more drama and rachets up the pressure and provides another element to the race, ie, who can handle this unexpected new pressure. With the rule how it is, if an athlete false starts there is still the same time delay to get them re-started, yet one of the competitors is missing. What happens if in the 100m London final all the athletes decided to unite and false start to there is no race, would they go change the rule? I agree 100%. 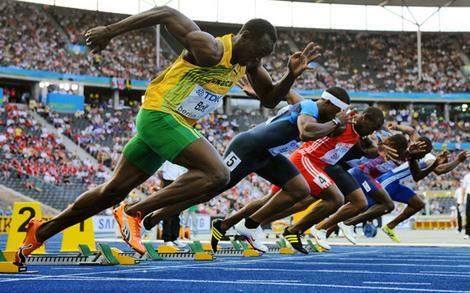 The no-false start rule will kill sprinting. The IAAF has become a non-democratic,elitist, and highly unaccountable bureaucratic organization. It is high time we have a governing organization that is in touch with the concerns of athletes, coaches, and fans! Wow! You made real points. Am almost convinced the false-start rule is wrong! Well, it could be better to revert to 2nd false start by an individual athlete that leads to disqualification than to re-adopt the rule that places all competitors on yellow after someone false-started the 1st time! The current rule is ok, plain and simple. Every starter will definately get used to the rule like the rule that prevents lane-cutting on the bend! When any sprinter is cut and got disqualified, he or she should take it in good fate like a leading hurdler that trips on the last hurdle…A good start is then every sprinter’s 1st hurdle, so dont trip from the start…I love your article a lot anyway…its a pity your friend got DQ. Am truly sorry…Gail Divers got over her last hurdle tripping at Olympics final she could have made double champ in 100m and 100mhurdles,your friend too will.